When designing pallet racking there are many pallet racking design element considerations some of the most important are listed below. This is before aisle widths, transfer aisles or pallet turning and pallet retrieval clearances are considered. This shows the importance of selecting a competent and experienced pallet racking supplier and pallet racking installers. 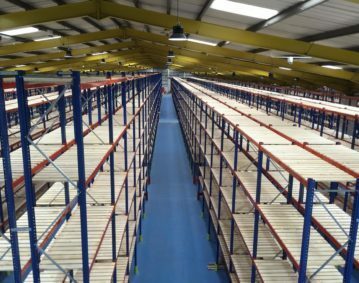 Selecting the correct pallet racking beam length is important not just to give you the correct space to store pallets but also to allow for the recommended clearances. Considering the pallet racking run and building length alongside pallet weights and pick rates will help you select the correct beam length. Pallets are usually stored two to a bay level in 2700mm clear entry beams but there are many variants that can work far better in many cases. If you want to reduce the number of frames and therefor the cost of your pallet racking you may wish to store three pallets per beam level. However this does not always offer the best solution particularly if the pallets are heavy. In short as discussed above the weight of the pallets of objects stored on the pallet racking beams is the beam loadings. These are not to be confused with the bay loadings for more technical details call our pallet racking design team. There are many types of pallet racking beams with most manufactures offering several types of very similar beams offering different loading and cost options. The main two types or pallet racking beams are open section and closed or box beams generally these boxbeams will offer a higher beam load than an open beam of the same size. However this is not always the case so if in any doubt check these details with an expert. Put simply this is the gap in between the pallet racking beam levels in the height up the bay this is measured from the top of one beam to the top of the next beam. Beam types and the beam pitches that are available in different pallet racking systems varies so ultimately one manufactures specifications may not be the most suitable for your pallet sizes. An example of this would be a system that uses deep beams it could mean the difference between being able to get a further beam level and ultimately several hundred more pallet positions in a building. This is the measurement from the ground to the first beam and can be absolutely critical when working out the loadings that a pallet racking system will take. So if you increase the level to the first beam you could find you are overloading the pallet racking system. This is the height of the pallet racking frames this does not mean that it has to be the height up to the top of the top pallets so again savings could be made. This is the depth of the frame or overall fronts to back measurement most commonly 900mm or 11000mm although there are many variants that can affect this. This is the loadings that the pallet racking frame can take and is used to calculate the safe working bay load. One of the key considerations is the upright duty which again varies between manufactures and their various products. Most commonly standard duty medium duty heavy duty and extra heavy duty. Pallet racking foot plates vary in loading ratings, design and costs with certain types giving better bay loadings and certain types working with different forklift trucks and warehouse systems. If you require any further information on pallet racking call our pallet racking design team. How are Warehouses Preparing for Brexit?